The Nokia Lumia 610 runs Windows Phone 7.5 Refresh. The latest release was revealed at this year's MWC in Barcelona under the codename Tango and should be on all second-gen WP7 smartphones already. The very point of this update, barring some minor added features, was to allow the OS to run on less powerful hardware. The 1GHz CPU and 512MB RAM threshold has been lowered and the Lumia 610 does reasonably well with an 800MHz processor and 256MB of RAM. What it cannot do is run some memory-intensive apps, like Skype (upon trying to install it off the marketplace, you get a "not available" warning). HD recording and playback are missing too. App backgrounding has been disabled, but that doesn't mean an end to multitasking - the WP7 version of it anyway. Quick switching between apps is supported, and so are push notifications and live-tile updates. It is almost impossible to tell WP7 smartphones apart by looking at the interface. The simple but effective two-page homescreen does not lend itself to customizations the way Android does. In the Windows phone ecosystem, the difference comes from the preloaded software, which is one of the highlights of the Nokia Lumia 610. Before we begin, here's a demo video of the Nokia Lumia 610 in action. Swiping the lockscreen up unlocks the device and reveals the live-tile Metro user interface. It's a vertical grid of Live tiles that can be reordered the way you like. Practically any app can be placed in the grid by holding your finger over it and selecting the Pin to start option. It's a clean and simple interface. The Live tile of each app shows info relevant to the app's function - stuff such as the current date, pending calendar events, missed calls, unread emails and more (third party apps do it too). The Marketplace tile displays the number of updates available, while the Pictures tile is essentially a slideshow of your photos. It's nice to have all that info always available at-a-glance. You can look at them as homescreen widgets of sorts, but that's a bit oversimplifying. By the way, a thing we really like about Windows Phone is that you can wake the phone and jump straight into the camera by pressing and holding the camera key. You can access all installed apps by going into the application list - which is a swipe away from the Live tiles. Apps are alphabetically sorted there and you have a virtual Search button to easily locate apps if you have many of those installed. The Lumia 610 goes about multitasking like every other WP7 smartphone. It's not true multitasking; things are being done the iOS way. Apps not in the foreground are suspended, but the OS has ways to take over and carry out the task for them. To switch between apps you press and hold the Back key. The app switcher itself looks similar to that of WebOS or a bit like Android on Sense UI: thumbnails of the apps, ordered chronologically left to right. You can scroll the list horizontally to select an app and a tap will bring you back to exactly how you left it. It's never more than the last 5 apps,- the one on top is always the start screen. You can't "kill" any of those apps, this is more of a history of the recently used apps. Eventually, as you open more apps, the older ones start to drop out of the list. Once an app is gone, you have to launch it again the old-fashioned way, which means you'll need to start over. However, the browser for example will still load the last visited page. The Nokia Lumia 610 runs on a Qualcomm MSM7227A Snapdragon chipset featuring a single-core processor, clocked at 800 MHz,and the Adreno 200 GPU, coupled with the lowly 256 MB RAM. It's obvious that you can't expect miracles in terms of performance, but you are probably wondering how much difference the dated hardware makes. BrowserMark adds HTML5 to the equation, but hardly changes the picture. 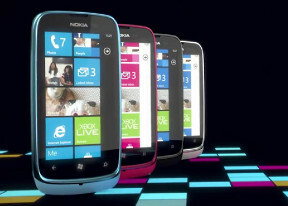 The result of the Nokia Lumia 610 is nearly two times lower than that of its competitors. The Internet Explorer fish tank test has been around for some time now. It's HTML 5 based uses the GPU rather than the CPU to do the heavy lifting. The Adreno 200 isn't really the performance champion either though and the Lumia 610 reached just 18 frames per second. In comparison the Omnia W and Lumia 710 went as high as 52 and 50, respectively. It's safe to say that the Nokia Lumia 610 isn't the fastest phone around. It's mission is to offer an attractive price tag even if that means cutting a few corners in performance and it shows. The Lumia 610 didn't struggle in too many of its daily tasks, but whenever we had to open more intensive apps such as Nokia Drive or Maps, the effects of the less capable hardware were easy to spot.